Joining the Millie, Monty Q, Meezer and others on a road trip to Lux's. If mum can go on a trip, so can I. I will even help drive, hmmm, must be hard to press the pedal things and use the wheely thing at the same time. This will have to be a joint effort. Plus while mum was gone a couple of packages arrived for me. One from Gretchen, for guessing the correct number of fluffy little creatures. So all sorts of goodies came, including some lizards!!!! 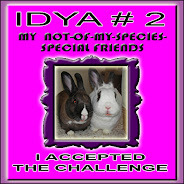 Then from Samantha & Tigger, for guessing when they had their 200th post. Those are the type of contest things that I am good at, guessing, or just good luck. A whole big box of fun stuff for me and mum from Florida, but what is funny is that Gretchen from Oregon sent the lizards!! I will pack up the nip and treats for the road trip. Thank you all very much, all of this will be put to good use!!! So what did mum bring me home from her trip? Well, she missed me so much she found and bought a little sleeping ginger and white kittie, so then she could have it nearby to pet. So she missed me. Yes, mum did go through Denver. She spent time waiting for the proper flying monster to take her where she had to go. That is where she had time to take pictures of the animals on the flying monsters. Oh, well, I won't be here for trick or treat. Probably just as well as mum won't let me help answer the door. I might want to go out and help the little ones go from house to house. So onward on the road trip. Here we go!! Bye. A cat can purr its way out of anything.- Donna McCrohan I was just checking out the treat and toy cupboard. Fevvers, must get them. Mum took the picture, then moved me out of the way and closed the cupboard. I just look cute, purred at her and gave her a head bonk. Mum and I had a nice weekend together. She got all of her stuff done and spent lots of time with me. It was nice to curl up at night together in the sleeping spot. I had a nice time at the spa. Got my usual good report, they think I am a sweetheart and cute kittie. I am welcome to come back! I looked through her pictures that she took and look at all of the animal pictures I found. The flying monsters she was on all had a picture of a furry wild creature on the monster. She saw lots of them and here are some of the pictures. Wild cats, bears, birds, buns. She said the ones she was on had an eagle, a snow shoe rabbit, a whale and an otter. Thankfully she did not end up on a plane with a vishus deer on it. I don't think she took any vishus deer repellant along with her. But they did remind everyone that they could take a nap with the picture screens on the flying monster. Smart move, mum said she did take a nap, especially on the way out on Monday. She said she left here in the middle of the night to get there on time to take the flying monster. 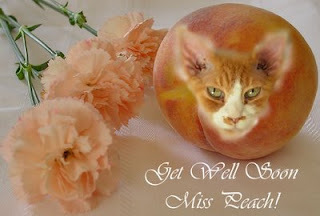 Lots of purrs to Miss Peach who isn't feeling well. We are all thinking of you and sending lots of purrs to you and your beans. Well, I didn't actually leave Whiskerconsin, but mum did and now we are both back home. She came an picked me up early today and brought me straight home. She had a few errands to run, like picking up the mail and getting the treats for the little people for Halloween this next week. But she did get all of that done before she came to get me. Now in between her looking at the big pile of papers she picked up, washing all of her clothes, we are snuggling. I am getting lots of scritches and treats. I have check out the whole house, things look fine. The birdies are at the feeders, my food and water bowls are all full. But I did have an intruder kittie run through the yard, but mum couldn't get a picture. Mum, nose to nose with Juniorbabee. More later, back to snuggling. 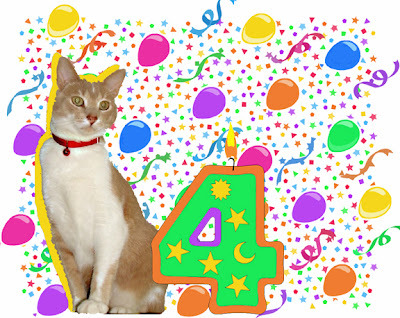 Wow, thanks to all who attended my purrthday party yesterday or those who just stopped by to send your good wishes. I appreciate the time you took out of your weekend to stop by. It was a wonderful day, the day was sunny and warm. So we spent a lot of time outside. We played in the leaves, played hide and seek in the garden. We even had a tree full of cats. Mum didn't get a picture with everyone in the tree, but today Virginger was hanging out in the tree. Otherwise, we sat on the patio, watched the sun set and the moon rise. We visited, ate lots of good foods, drank wonderful drinks. I entered the Halloween Contest. You can go vote for me. I just made a nice greeting, I don't wear costumes or have a stroller to pimp. But now I am tired. So I am off for a few days to rest up at the kittie spa while mum goes somewhere for work this week. So ManCat Monday and Fang Shui Friday will return next week. Hello and welcome to my purrthday party. Please sign the guest register for the party, by leaving a comment on this post. Then join us at the Chatzy spot to party away! I have headed off to bed. Help yourself to the leftovers on the buffet! Thanks for stopping by. Food, fun, furiends. What more do we need! Thanks to Zoolarty for the picture! You guys are great. When in the garden, savor the colors of its inhabitants. Nature's colorful creatures have great healing properties and can sooth the spirit and the stomach. Saturday October 20. Starting at Noon, US Central Time on Chatzy. To figure out what time that is in your part of the world, check out the time converter. Everyone welcome. Details with the Chatzy link will be on tomorrow's post. Hope you can stop by. One of our new blogging gang, Tybalt, gave me this award. Thank you. 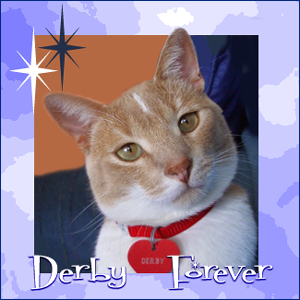 If you haven't met Tybalt yet, please drop by and say hello! Here is a couple of pictures mum took while she was driving the metal monster. We live in a quiet area, so it is safe to stop and take a picture. She was not driving like a crazy person. Some of the trees are turning red, others are sort of yellow and some are still green. It has not been frosty here yet this year so many of the leaves are still on the trees. Mum also saw this car ahead of her as she came home from shopping. I think this car was meant for the House of Mostly Black Cats. They just missed having the 'M' in the plate. Don't forget about the party on Saturday. Hope to see you all there. A cat pours his body on the floor like water. It is restful just to see him. - William Lyon Phelps All stretched out and covering as much floor as I can. Iknow I get mum all relaxed when I am around. Make her push work out of her brain for a while. I have been honored with a blog award from BeauBeau and Angie. They love my blog! Gosh, and thanks. Now I need to pass this on to those blogs I like. Max, the Pyschokitty - where would any of us be without him. The Crew - letting me know what I am missing (thankfully) of living in a house with more than one cat. Cat Naps in Italy - American cats in Italy, they have such interesting adventures around that country. Fat Eric - My fellow Gorgeous Ginger and UK feline star. Now for my party on Saturday. The spot will be on Chatzy, starting about noon my time on Saturday. That would be about 6 PM in the UK. That way our European furiends can drop by as well. More details to follow later in the week. This party won't be as big as last years bash, where we honored every kittie we could who had a gotcha day or purrthday in October. That was a three day party. This is just to hang out and have fun. Lots of food, although I don't think we can beat what Jack had this weekend at his party. Just fun times with our furiends. Always stalk from your power direction. Your power direction is anywhere downwind of the one stalked. Here I am getting ready to pounce on the unsuspecting feather and toy. I liked this sooo much it is now in pieces. I still have the little blue head that I bat around the feather got shredded. This was from my Secret Paws last summer. This little yellow guy was making his way across the patio. Does this mean a good or bad winter for us? Mum doesn't know and doesn't believe that little fuzzy outside things can predict the weather. Most likely a birdie found this later and had a snack. This picture is from earlier this summer. It has flowers and even flying flowers, that means a butterfly! We have lots of butterflies around the yard. This is one of mum's better pictures of one of the monarch butterflies who visited. Yipee the weekend is almost here. Oh, and mum says I can have a purrthday party next weekend. Tune in Monday for details. I have taken up to putting the paw on mum sometimes. I am sitting next to her and not getting the attention I deserve. So I reach out and put a soft paw on her leg, side or arm. Then she pays attention to me, giving me pets. Then I can do the following. Wrap my warm fuzzy body around her hand. Then put the bitey on her. Oweeee! Hehehehehe. Hope everyone is staying warm. Where it was hot a few days ago, it is snuggle and keep warm time here now. Cool and rainy. No amount of time can erase the memory of a good cat, and no amount of masking tape can ever totally remove his fur from your couch. Leo Dworken That is why mum keeps a throw on the couch. Then she can wash it and has two, one on the couch, one being washed. Less fur to remove from the couch, but my furs will forever be in this house, even after we leave. If we ever leave. Plus the bad news from Wiskerconsin on the shooting is no where near where any of us Whiskerconsin blogging cats live. It is over 200 miles away from where most of us are in the south part of the state. This happened "UP NORTH". Lots of purrs to the families and the whole community that is affected by this tragic happening. I didn't even know about it until the afternoon. Fat Eric wanted to know if I was OK as it made the news in the UK, even the BBC website had the story. Yep, I am OK, but sad. Another warm day, so warm that mum turned on the AC. In a few days this warmth will be gone and it will be snuggle weather. Mum got out some of her warmer clothes and put away her sandals. Mum finished reading the big orange book on Saturday night. Now she can go back to the other book she was reading. Not as long, but a history book and slower reading and half as long. No reading on Sunday, other than the newsy paper. She updated my links and other stuff on the blog, watched CrashCar and then the Packer's played in the evening. Skeeter and LC tagged me for the screen shot meme. So here is the screen shot of the new laptop screen. 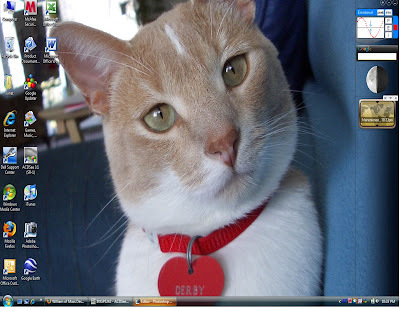 Mum prefers a nice clean desktop and I think in time even a few of these icons will go away. Plus the new puter is on Vista Windows, so you get to put 'gagdets' on the right hand side. Mum as a picture of what the moon looks like, a biorhtym thing, a clock and a direct link to search google. As you can see she has me on the screen. This is one of her favorite pictures of me. Below are the rules for the meme. I think most everyone has done this, so I won't tag anyone. But if you want to share, please join in. Upon receiving this tag, immediately perform a screen capture of your desktop.It is best that no icons be deleted before the screen capture so as to add to the element of fun. 1.Go to your desktop and press the Print Scrn key (located on the right side of the F12 key). Mommy bean note: On a laptop you use the Fn + prt sc keys then paste it into a graphics program. 2.Open a graphics program (like Picture Manager, Paint, or Photoshop) and doing a Paste (CTRL + V). If you wish, you can “edit” the image before saving it. Mum is getting closer to finishing the book. But firsted she has to clean, go grocery shopping, do the laundry and even though it is warm, getting out some of the fall clothes. Plus she sort of cleared out some of the older stuff so she has room in the closet. Time to rotate warm weather clothes to the cooler weather clothes. Mum says she has lots to do this afternoon, like cooking too. Good news is that the Packer game does not start until tonight. So she has all afternoon to do stuff. For being the end of the first week of October it is furry hot here. As much as in the middle of the summer. It was in the mid 80's today. Mum did her work early then went outside with this big fat orange book. I know that some other kitties had their beans ignore them when they read this book and it is happening to mum too. She spent all afternoon sitting outside and reading. The only good thing is the I think she will finish it quickly. Purrs to Miss Darling Millie and her mum. Jasmine went to The Bridge yesterday. She had been having some issues with leaving not so nice presents in unusual places. They think it might have been bladder cancer. She has joined Gizzy at The Bridge, free of pain. Here she is on her special quilt that her mum made for her. Otherwise it has been a quiet weekend. Too hot to do much, this is not snuggling weather at all. Mum says by next week we will have snuggling weather again. Use the energy of the earth to ensure a successful hunt. Flatten your body; become one with the dirt. Feel its power flowing through you. I may not become one with the dirt, maybe just one with the carpet. I am ready to attack my feather toy that I pulled off the big picture window door. I looked like I am ready to pounce. This is a fall blooming clematis. This was here when mum bought the house and she loves it. Last year it didn't bloom, so she was afraid it was dying. But this year it came back and bloomed, but not as full as it has in the past. Mum says she saw one a while back that was huge. She also thinks that this would make a pretty place for a bride to have her picture taken in. So pictures from the patio, then getting closer to show the detail of the flowers themselves. This is just outside the kitchen windows, so I can see it too. Oh, and the other day, we had a meezer visit the yard. Sort of looked like Cheysuli, but he or she did not stop over to say 'hi'. It went behind some of the bushes in the garden and we didn't see it again. Hey, it is Friday. Weekend time, yippeee. Oh, and stay tuned for my birthday plans. I am bugging mum to let me have a party this year. It probably won't be as fancy as last year's bash, which went on for three days. But I am wearing mum down on this. Keep your paws crossed. 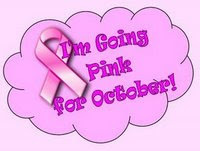 To give support for all of those who are affected by Breast Cancer. I will even make the background for my blog pink. Happy October First everyone. The bestest month of the year, 'cuz it is the month I was born in! I will be bugging mum every day for extra treats and toys because I know she will spoil me, as usual. It was very nice having mum around all weekend. First, the weather was nice, so that meant the windows were open all weekend. To have nice warm and sunny weather this time of the year for several days in a row can be rare. Even mum was saying how nice it was. With the windows open it blew down the peacock feather for me to play with. But that is the only feather I want to play with. Mr Hawk paid us a visit yesterday. All of the birdies scattered and he swooped through the yard. I don't see that he got any little birdie, but he flies so fast he might have gotten one and we just didn't actually see it.